Q: Do you just naturally look and sound like Tom Petty, or did you have to work on it? A: I didn’t really have to work on the, look too much, for years people told me I look like Tom Petty and I’ve just gotten used to it, now I don’t think twice when some says it. I would say it’s primarily the hair by coincidence I’ve had a very similar hair style to his all my life. For some reason we have similar stage presence, guitar style and vocal range, it’s something that I’ve done naturally for many years. The main things I’ve had to work on are vocal phrasings and inflections, which are the key to the delivery of the songs. Q: Why has Tom Petty’s music stood the test of time? A: The primary reason is that he is a great songwriter and writes songs that are timeless. Petty’s songs are stories and statements about everything from relationships to life in general that just about anybody from any generation can relate to. He’s created songs with great melodies, harmonies and hook lines that seem so simple from a distance, yet when closely analyzed are brilliantly crafted pieces of a musical puzzle that always seem to fit just right. Q: What are some of the other bands you have played in? Q: What is Tom Petty’s most defining musical characteristic? 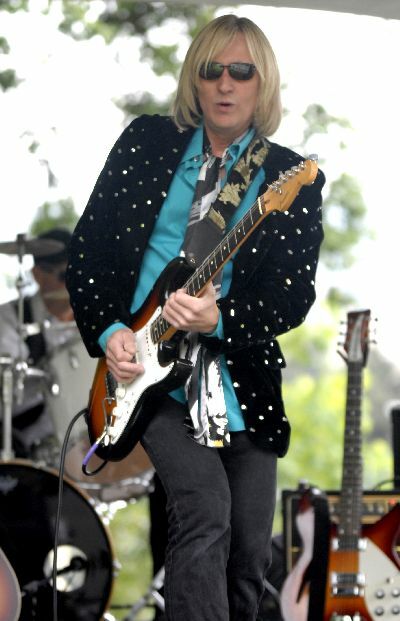 Tom Petty has a unique blend of musical influences that include Bob Dylan, Roger McGuinn, Elvis and the Beatles just to name a few. Depending on the song, you can hear the best elements of those influences through his vocal phrasing and the timber of his voice, quite often with a bit of a nasally tone which I believe is more or less his signature sound. You can hear his voice on the radio at any given time and know it’s him. Q: What is your strangest backstage story? late night appearance, so I did the set and many of the people thought I was Tom Petty. After the performance, there were a bunch of girls lined up to get autographs backstage and one girl in particular insisted that Brian (the other guitar player) and I sign some of her upper body parts. I asked if anyone had a sharpie, nobody had one, so I asked for a pen. Somebody handed me a pen, meanwhile the girl just kept yelling “Tom, Tom, Tom please sign these”. At this point I tried to tell her “I’m not Tom Petty”; however she refused to believe it and wanted me to sign as requested. I started signing but it was a ball point pen and the ink had dried up, so I tried to sign it without ink and you couldn’t really see it, then she says, “ press harder so I can see it”, well this went on for about 3 tries until finally there was a fairly significant signature etched into her skin, at that point she was happy and went on her merry way. Q: Have you ever been mistaken for Tom in a non-performance situation? A: I’ve been mistaken for Tom Petty many times, that’s kind of how this all stated in the first place. I typically will tell people I’m not Petty, however I do a tribute show and then introduce myself. Q: What is the definitive Heartbreakers song? A: This is actually a tough question if you consider all the great songs they’ve put out through the decades. However, if I have to choose one, it’s American Girl, what a masterpiece song, It’s got the all the elements that create the Heartbreaker sound: jangly guitars, layers of keys, great vocal harmonies and of course Tom Petty’s signature vocal. I was born and raised in Portland and grew up in local music scene, I’ve traveled and played in many parts of the world over the years, but absolutely love it here. First of all, the Portland/Vancouver music and arts community is awesome there’s a pool of talent equal to or greater than any major city in the country, with an abundance of music venues/events and a city that supports live music. Second, it’s just a beautiful city with a very tolerable climate without too many of the weather extremes you find in other parts of the country, plus you can go to the beach or mountains in less than 2 hours either direction. Q: Have you ever met Tom or communicated with him? A: I have never met Tom Petty, would love to someday! I have met his lead guitarist Mike Campbell a couple times when he was playing in LA with his side band The Dirty Knobs, however, he had no idea I was a Petty tribute guy. Q: What Tom Petty song would make a good theme song for my blog? A: It’s has to be Running Down A Dream! This is such a great song in many ways, primarily because it’s an anthem for those of us that choose to follow our musical dreams!